Charles Wood, in his own inimitable style, has brought out another amusing book on the more recent exploits – highly commendable, too, even if latterly competitions have ended up as bridesmaids rather than victors – of the Somerset County Cricket Club. Halsgrove, the well-known West Country publisher, have again produced a nice sized, extremely well presented book for the author they feel the need to disown again in their Publisher’s Disowner. I know they like him. I admit to having a soft spot too having seen Charles generously acknowledge my previous review of a book of his and take this opportunity of extending my thanks. A spot of envy too to find him living in the delightful village of Wiveliscombe and able to forge a living from, amongst other avenues, writing books having given up the legal profession almost two decades ago. Former Somerset stalwarts from the 1970s and later have helped forge some of the amusing anecdotes from within Charles’s latest book. 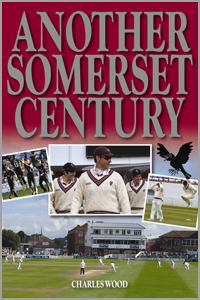 The book starts with words which might have felt unbelievable had he been writing about Somerset pre-1979 when silverware in the form of the Gillette Cup came to Taunton for the first time in their then 104 year history. How Somerset Cricket Club possibly became one of the top four domestic teams in the world and – okay to return to more identifiable times – the agonies involved on the journey. There’s some Latin too underneath which I trust my ex-Latin teacher, Vic Marks, who contributed with anecdotes, will vouch for. As I am unlikely to see Victor before finishing this review, I shall ask the other Latin teacher I know, my mother, to confirm that Spes est id Quod Offendit really does mean the somewhat paradoxical It is hope that hurts, my own Latin now stretching no further than the more well-known Ne te confundant illegitimi. Moving back to English and cricket, Charles takes us through the ups and downs of the 1980s and 1990s with several amusing anecdotes given to him by former cricketers including Keith Parsons, who did so well in the NatWest final of 2001 when Somerset beat Leicestershire to add to their trophies. The Twenty20 trophy followed in 2005 under the captaincy of the esteemed South African, Graeme Smith. The famous matches include scorecards and, in his own amusing style, Charles details the summer happenings through the use of people interviewed. Not all of it makes for happy reminiscences: four captains in 2006 but it does become noticeable that certain players including Ricky Ponting and Graeme Smith had a big effect on the club. I well remember one "agony along the way" when making my annual trip to Taunton to the top of the Ondaatje Pavilion where the legendary Ted Crowe held fort. The match against Durham in 2004 started on the fourth day with Durham a West Country mile away from victory (280 further runs requiring 450) and only five wickets left. Ted complimented me on coming down from Swindon with the prospect of the match possibly lasting only a further five balls. Durham won. Charles picks up on many of the people on and off the field who make Somerset such an exciting place to watch cricket. The fierce rivalry between Zum and Glawster - or Somerset and Gloucestershire to those not necessarily from the West Country - is well chronicled especially the 1999 NatWest final which resulted in the latter's victory during their golden area of one-day cricket. Once again, Charles Wood has given us a highly entertaining and amusing account of Somerset's more recent past and I am sure many people from the West Country and further afield will enjoy his latest venture.